Tejashwi said the Nyuntam Aay Yojana scheme will put a massive dent in the vicious cycle of poverty in Bihar. Coming out in full support of the Congress’ proposed minimum income scheme NYAY, RJD leader Tejashwi Yadav on Monday said it will have a far-reaching impact for the people of Bihar and make a “massive” dent in the vicious cycle of poverty. Tejashwi also said the Bihar grand alliance, which represents the oppressed and marginalised sections of the society, has rattled the BJP-led NDA, and asserted that it was not a “lackluster alliance” but a “robust rainbow coalition of not only political parties but also of social constituencies”. “The Nyuntam Aay Yojana or ‘NYAY’ proposed by Congress will have far-reaching impact for the people of Bihar. It promises to put in the hands of the poorest, a regular sum of money every month to be spent on basic necessities,” Yadav told PTI in an interview. “The people of Bihar have been victims of ‘annyay’ (injustice), suffering from the anti-poor policies and actions of the central and state governments, and it is high time they should demand and get ‘NYAY’ (which in English means justice)”, Yadav said. The backing to NYAY by Tejashwi, whose party has forged an alliance in the state with the Congress and four other political parties, came barely a week after the big-bang poll promise by national party’s chief Rahul Gandhi that Rs 72,000 per year will be given as minimum income to poor families, benefiting around 25 crore people, if his party is voted to power in Lok Sabha polls. 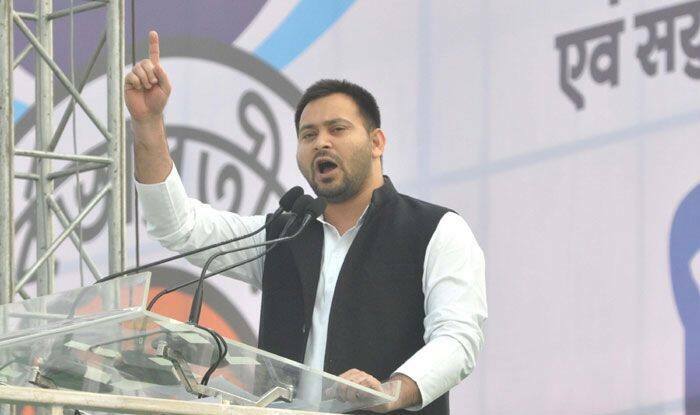 Emphasising that the scheme will put the money in the hands of those who need it the most after “economic mismanagement” by the state and Union governments, Tejashwi said that the Rashtriya Janata Dal (RJD) is of the firm view that NYAY will make a “massive and desirable” dent in the vicious cycle of poverty which severely impacts the access and opportunity structures for the poor. “Now when we have shaped it…one should look at the rattled NDA,” the former Bihar deputy chief minister said. After prolonged deliberations among its partners, the ‘mahagathbandhan’ (grand alliance) in Bihar finally announced the seat-sharing details of all the 40 Lok Sabha seats on Friday which included candidature of RJD leaders Misa Bharti and Abdul Bari Siddiqui from Pataliputra and Darbhanga respectively, besides Congress’ Meira Kumar from Sasaram. As per the seat-sharing arrangement, the RJD has got 20 seats, out of which it is giving one to CPI(ML), the Congress has nine, followed by five for Upendra Kushwaha’s Rashtriya Lok Samata Party (RLSP) and three each for former Bihar chief minister Jitan Ram Manjhi’s Hindustani Awam Morcha (HAM) and Mukesh Sahni’s Vikassheel Insaan Party (VIP). “The scheme’s primary objective is to ensure that 20 per cent of the most disadvantaged citizens receive an annual income of Rs 72,000, he said. The money will be directly credited to the account of the women in the household, thereby, not only empowering them but also at the same time ensuring that it is prudently spent, RJD chief Lalu Prasad’s son said. “After several years of economic mismanagement during which only the rich prospered, NYAY will benefit the farmers and farm workers, and lakhs of people working in the informal sector. “After disastrous policies like ‘note-bandi’ (demonetisation) took away money from the hands of the people, NYAY will put it where it belongs — in the hands of the people who need it the most and will spend it to improve their lives as well as boost the overall economic activity,” he said. Anybody who has keenly followed Bihar politics would understand that it is the RJD which has sacrificed the most in order to create a rainbow alliance against anti-poor and anti-constitution policies of a “person driven by megalomania”, Yadav said.